The V-Guard Shovair H Exhaust Fan keeps your rooms free from stale air. Its powerful motor and blades quickly freshens your room. The V-Guard Shovair H Exhaust Fan 225 mm has a rust proof body which gives it durability and is easy to clean. Customise your home and office with a range of stylish and effective world class fans from V-Guard. It helps you despise strong smells and keep the air around you purified and fresh. Every V-Guard Shovair H Exhaust Fan has been specially tested and designed to ensure unmatched cooling and air circulation. Get adequate ventilation and fresh air in your home with the help of this ventilating fan by V-Guard. This one is high in quality and durable. It has specially designed strong metal blades, power coated metallic finish, and sturdy bird guard. Get this one home today. 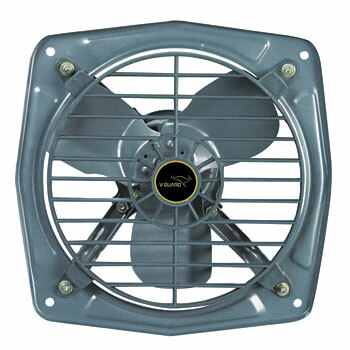 Its high speed exhaust fan-metal and a metallic finish strong metal body ensure a long lasting performance along with style in this exhaust fan.